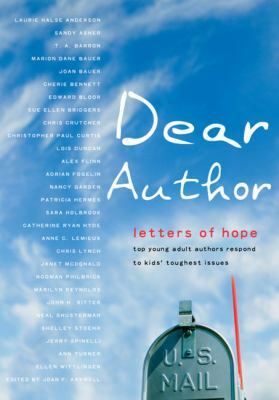 Dear Author is a wonderful, compact book of letters from kids and teens to authors. The teens pour their hearts out, telling the authors how their books have helped them, how some books have even saved lives. You’ll recognize some of your favorite authors. A teen girl writes to Laurie Halse Anderson about her experience of being raped by a guy at her school, and compares it to the book Speak. A girl writes to Lois Duncan, author of many young adult mysteries and of the non-fiction book Who Killed My Daughter? Her own stepfather killed her two little brothers and then committed suicide. She credits the book Who Killed My Daughter? with saving her life, but asks the question why? Why do these things happen? Ms. Duncan’s answer is very moving. Many other authors answer letters in this book, including one of my favorites, Chris Crutcher. Please read this—it’ll take an hour or two, but the impressions left by the authors’ deep sympathy for young adults will last much longer. This entry was posted in Hi-Low/Quick Read, Non-fiction, Young Adult Literature. Bookmark the permalink.